There are two major types of collagen fillers used for cosmetic treatments: bovine-based and human-bases. Examples of fillers made with human collagen include CosmoDerm and Cosmoplast. Bovine collagen fillers include Zyderm and Zyplast. ArteFill is a gel filler, consisting of synthetic microspheres suspended in a gel of bovine collagen. Collagen injections work best on wrinkles caused by folds and sagging in the skin itself, rather than those caused by the movement of facial muscles, such as laugh lines or frown lines. For these types of treatments, consider Botox treatments instead. Most candidates are men and women between the ages of 35 and 60 who wish to minimize the signs of aging. They are starting to see facial wrinkles, and want to turn back the hands of time. This treatment works best when the skin is still somewhat supple, although it has also been used successfully in older patients. Collagen injections are also used for treatment not related to aging, such as lip augmentation, in which collagen is injected into the lips to make them fuller. Those who should not good candidates include women who are pregnant or nursing or people with certain medical conditions or who are taking certain medications. Be sure to tell your doctor about any medical concerns so that he or she can evaluate whether you can undergo treatment. If you opt to undergo treatment with bovine-based collagen, an allergy test will be performed on your arm several weeks before the treatment itself. Patients cannot undergo bovine-based collagen injections if they are allergic to the collagen, though there are many alternative dermal fillers that may be used in its place. The following provides an overview of how collagen injections are administered. Prior to treatment, the patient is first given a skin test to detect any possible allergies to the collagen material. Before the injection, you can expect the doctor to cleanse the skin and apply either a topical numbing cream or a local anesthetic, although in some cases the collagen solution itself contains lidocaine, a local anesthetic. Next, the collagen will be injected around the targeted area. This process may require one or several injections depending on the desired results. Following the injections, there may be some temporary puffiness or bruising. This is normal and gradually subsides in a few days. The entire process usually takes an hour or less. After the injection process, patients are free to leave the office immediately and no bandages are required over the treated area. Complications are rare, but can include infection, scarring, an allergic reaction, or an uneven or bumpy texture in the treated area. There may also be some skin redness that persists for a week or more. This is particularly common in patients with fair skin. Patients are free to leave the doctor’s office immediately and there is no required recovery time. Patients can resume normal activities immediately. After collagen injections, the treated skin may be red, tender, or mildly bruised, though this usually subsides within a day or two. DID YOU HAVE COLLAGEN INJECTIONS? The results of treatment are visible immediately, and will last anywhere from three months to a full year. In some cases, the doctor may have slightly ‘overfilled’ the treated area, to account for the body’s absorption of some of the collagen, although this appearance should not last for more than a week or two. The duration of results is somewhat dependent on the type of collagen used. Regardless of the specific injected solution, the body will break down the collagen over time returning the area to its original appearance. What do Collagen Injections Cost? The cost of collagen injections is relatively low when compared to other cosmetic procedures. The price usually ranges from $300 to $600 per syringe, with a treatment session requiring either one or two syringes of collagen. 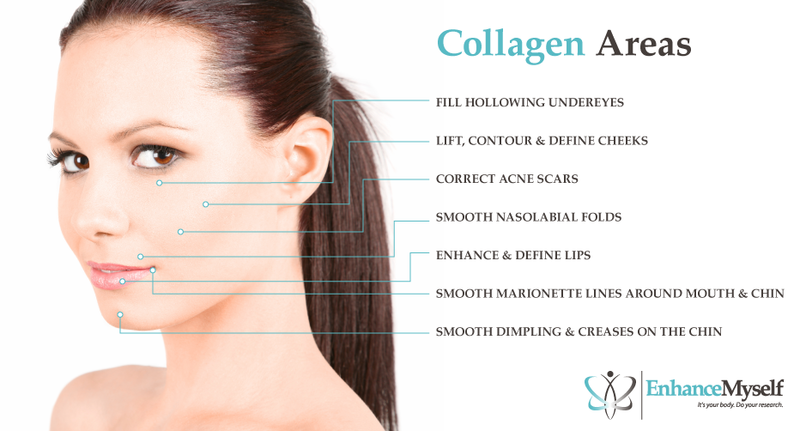 The total price depends on the specific type of collagen used, the doctor, the area being treated, and other factors. In general, more experienced doctors in larger cities tend to charge more than their less experienced counterparts in sparsely populated areas. Injections of collagen for cosmetic reasons are not covered by insurance. Recognizing that cost is a concern for many patients, some doctors offer financing options and payment plans to make the treatment more affordable.